As we age things are supposed to get easier. Unfortunately for some people, getting older comes with new stresses that our bodies and minds aren’t used to. If you or a loved one is experiencing stress related to getting older, here are some tips to help seniors relieve some of the physical and mental pressure. Eat a balanced diet: Ensuring that you are getting enough calcium, vitamins and protein plays an important role in relieving stress. When we don’t eat right or eat enough our bodies retaliate by making us tired, weak and stressed out. If you can’t eat three meals a day, try for two and some snacks. Eat healthy and nutritious foods like green vegetables and lean protein like chicken and fish. If you have issues with chewing, try smoothies or even meal replacement shakes that are high in vitamins and protein. You may also be taking medication that cannot be properly absorbed by the body unless it is taken with food. Make notes and set daily reminders to make sure that you are taking your medication with food. If you have a caregiver, they should be ensuring that you are eating a balanced diet and getting the required nutrients your body needs to keep stress at bay. Talk to someone: Getting older can be a very stressful experience. 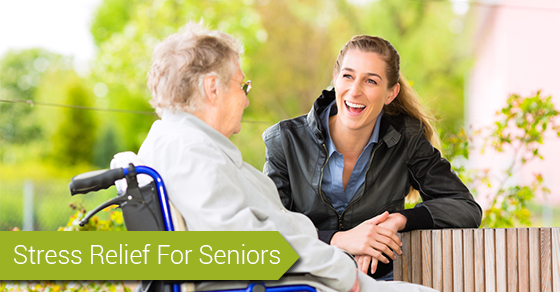 Many seniors turn to counsellors, therapists and psychologists to help them deal with the aging process. If you can’t talk to a professional, talk to a loved one. Talking to a friend or family member regularly, even if it’s a phone call or text every few days, can help you deal with stress and keep your mind busy. Read: One of the reasons people get so stressed when they reach their golden years is that they have nothing to do. Boredom can lead to major stress on the body and mind and there’s only so much sitting around you can do. Reading can help you fight boredom and keep your mind active. With e-readers you don’t have to worry about buying actual books and most of them can store many titles at a time. E-readers are also great for people with poor or failing eyesight because you can adjust the screen colours, print size and font to exactly what you want. Stay active: You may not have the stamina or energy to run a marathon anymore but that doesn’t mean you can’t take daily walks around your neighbourhood. Staying active helps your mind and body combat stress and like reading, keeps you occupied. On days when walking outside is not an option, head to your local shopping mall and take a leisurely stroll as you window shop. You can even buy some goodies for the grandkids while you’re there. Remember that you are not alone: You are not the only one who is getting older and sometimes keeping that thought in the back of your mind can make all the difference. Connecting with other seniors be it through a mall walking group, art class and other fun activities, will help you remember that you’re not alone as you age. Stress can be a concern at any age, and there are always more tools we can add to our arsenal for combatting stress. But as we age, it becomes increasingly important to exercise some self-awareness, to reflect on our needs, and to ensure we’re doing everything we can to manage our stress levels and live a balanced life.